How do you like to eat your chips? Whether you’re a fan of classic British chip shop chips dripping in salt, vinegar and ketchup, or you prefer sweet potato chips with lashings of sriracha, it’s unlikely that you will have given much thought to the other properties of these sauces aside from making your chips taste even more delicious. 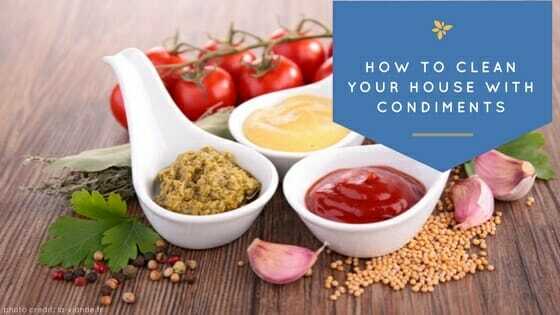 However, the humble condiments in your kitchen cupboards could prove just as useful as products like bleach when it comes to cleaning your house. Of course, we’re not suggesting squirting tomato ketchup all over your white walls to get a mark off, but it’s likely that your favourite condiment could prove useful during a spot of spring cleaning. Let’s start with good old ketchup, which is the preferred chip accompaniment of 43 per cent of the British public, according to a 2012 survey carried out by YouGov to coincide with National Chip Week. But did you know that red sauce can also be used to get stains off copper and silver items, such as pans and cutlery? The ingredients found in ketchup make it a great stain remover if you use a small amount to clean a stubborn mark, leaving it to sit and soak in for between five and ten minutes. Then, simply wipe the sauce off and the item should look as good as new. Mayonnaise – the favourite condiment of Londoners, according to that 2012 survey – can also be used around the house. For example, if you’ve had novelty Christmas lights stuck to the windows over the festive period, clean the panes with mayo and any residue glue should come off easily. This can also be a handy tip when trying to remove stickers from children’s bedroom windows. What’s more, mayonnaise can be used to get water marks out of tables or other items of wooden furniture, so it’s always worth having some in the house. Mustard itself is one of the more pungent condiments, but it is actually very useful for getting smells out of kitchenware. If baking trays or pans smell due to residue from strong-smelling meals such as curries, simply sprinkle them with mustard powder, pour on cold water and their previous neutral smell should be restored. The grainy texture of mustard powder also makes it great for scrubbing build-ups of grease on kitchenware, in a similar way to baking powder, which is another popular household item often used for cleaning. It’s likely that you will have already heard about using vinegar to clean certain things around the house, but it’s apparently the second-most popular accompaniment to chips in the UK, favoured by 57 per cent of Brits, so we thought it was still worth including here. The acidity of vinegar makes it ideal for getting stains off shower screens, microwaves, windows and stainless steel household appliances. Vinegar can be quite pungent, so mix it with lemon to make it more bearable to use and to leave your home smelling lovely and fresh. If you’re too much of a condiment lover to want to waste any on your domestic chores, you can always enlist the services of a professional cleaning company instead, who will bring their own cleaning products with them, leaving your favourite sauce safe in the kitchen cupboard.